Looks like you are currently in United States but have requested a page in the Cambodia site. Would you like to change to the Cambodia site? A unique synthesis of the three existing Fourier-analytic treatments of quadratic reciprocity. The relative quadratic case was first settled by Hecke in 1923, then recast by Weil in 1964 into the language of unitary group representations. The analytic proof of the general n-th order case is still an open problem today, going back to the end of Hecke's famous treatise of 1923. 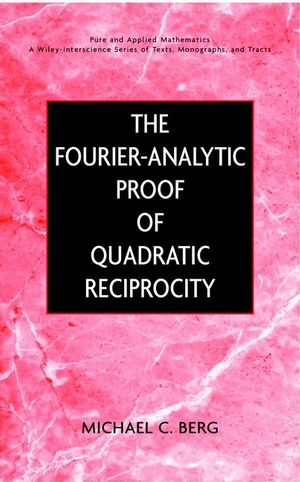 The Fourier-Analytic Proof of Quadratic Reciprocity provides number theorists interested in analytic methods applied to reciprocity laws with a unique opportunity to explore the works of Hecke, Weil, and Kubota. This work brings together for the first time in a single volume the three existing formulations of the Fourier-analytic proof of quadratic reciprocity. It shows how Weil's groundbreaking representation-theoretic treatment is in fact equivalent to Hecke's classical approach, then goes a step further, presenting Kubota's algebraic reformulation of the Hecke-Weil proof. Extensive commutative diagrams for comparing the Weil and Kubota architectures are also featured. The author clearly demonstrates the value of the analytic approach, incorporating some of the most powerful tools of modern number theory, including adèles, metaplectric groups, and representations. Finally, he points out that the critical common factor among the three proofs is Poisson summation, whose generalization may ultimately provide the resolution for Hecke's open problem. MICHAEL C. BERG, PhD, is Professor of Mathematics at Loyola Marymount University, Los Angeles, California. Hecke's Proof of Quadratic Reciprocity. Two Equivalent Forms of Quadratic Reciprocity. The Algebraic Agreement Between the Formalisms of Weil and Kubota. Hecke's Challenge: General Reciprocity and Fourier Analysis on the March.